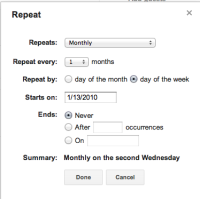 [CONFSERVER-51365] Add Ability for an event to occur on the Xth day of each month, week, etc... - Create and track feature requests for Atlassian products. This is important for events that occur on a regular basis that aren't every 4 weeks (resulting in some meetings occuring 2x in one month). A great example of this functionality is MS Outlook. Its recurrence function is elegantly simple and very powerful. As it is, to create the calendar I want, I have to create them in outlook, export as iCal and then import into Team Calendars. It's nice to be able to do that, but this seems like a feature that should exist within the Team Calendars recurrence functionality. CONFSERVER-49197 Establishing reoccurring events example: Every third Thursday of the month. 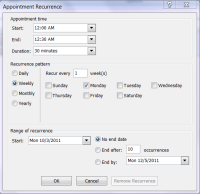 CONFSERVER-50200 Add custom repeat to "Create Event"